Home > Categories > Equipment > Knipp Services Inc.
Commercial buildings make up nearly one-fifth of all energy consumption in the United States, with schools and office and retail space representing about half of that usage, according to the U.S. Department of Energy. The three primary sources of energy usage include heating, lighting and cooling. As an ENERGY STAR Partner, Knipp Equipment can help reduce your building’s or facility’s energy consumption and operating costs. 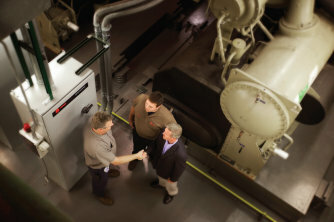 Measure and track the energy performance of your facilities at all locations. Technicians and maintenance and service personnel who receive regular training are better equipped to maintain heating and cooling equipment and components. View our most current lineup of classes. For more information about training, please contact Jonathon Goering.